During Bike Week LA, we collected nominations for the Golden Pedal Awards, Metro’s annual competition for great stories about bicycling. We’re featuring these stories in a weekly Why You Ride series – because for many Angelenos, every week is Bike Week. Vincent Baltierra, Sr., leaves his house at 5:15 every morning, pedaling his bicycle down Washington Boulevard alongside the hundreds of trucks hauling containers between the Ports of Los Angeles and Long Beach and the Union Pacific and BNSF rail yards. He clocks in before 6 a.m. at City of Commerce City Hall, where he works as a street maintenance helper. He’s biked to work this way for 10 years. 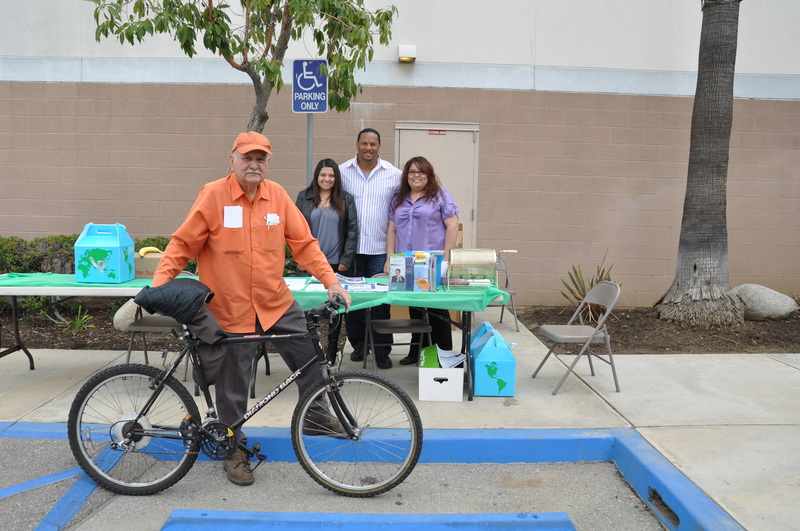 Mr. Baltierra and his bicycle at a City of Commerce rideshare event. Photo courtesy of Rebecca-Lee Longoria. He noted that the City of Commerce provides “great incentives” for employees to drive less. Employees who walk, bicycle, take transit, or carpool more than half of the distance to work eight days out of the month earn an extra $25 in their paycheck, as well as 50 cents for each additional day they participate. Employees who keep it up for ten months out of the year receive a $30 gift card to the retailer of their choice. On the other hand, there are no bicycle-friendly streets on Mr. Baltierra’s way to work. Washington Boulevard is the most direct route to work for him, but it is also a major truck thoroughfare. 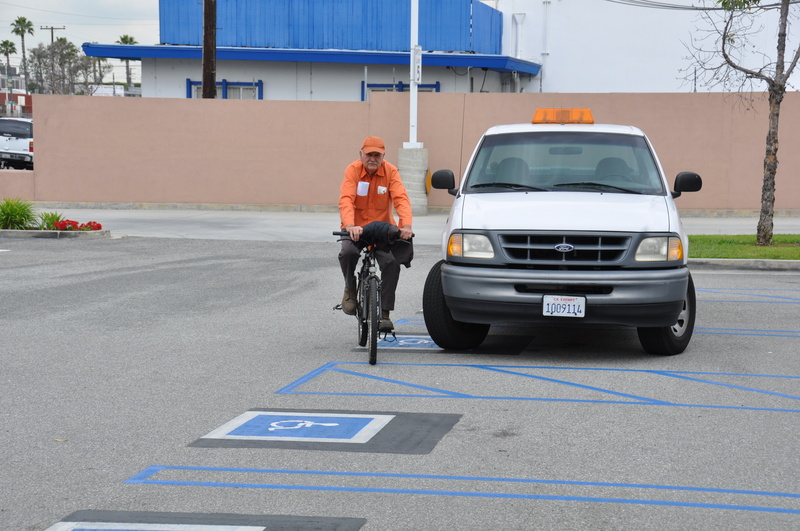 He uses reflectors, lights, and wears a thin jacket with reflective stripes to stay safe on his bicycle. To simplify his routine, he carries only his wallet and rides wearing his work boots. “Last year, I had fallen from my bike about four times. The worst one was when I did not know construction workers had been working on the pavement at night – I leave home when it’s dark – and the pavement was not even. As I was riding my bike, the tire hit the lumpy pavement and I flew over the handles of my bike and fell straight over the bike due to the speed I was traveling at. It was a slow recovery, but I still continued to bike. He occasionally bikes outside of his commute for exercise. When asked if he had a favorite route, he said, “I would if Commerce would have bike lanes, but Commerce does not.” Can somebody make this happen? Thanks Mr. Baltierra for being committed to improving air quality for everyone. We’ve sent you a Nathan safety vest, RydeSafe reflective decals, Clif Bars, and a free year of bicycle roadside assistance from Better World Club. Stay safe on the road! Mr. Baltierra bicycling in the City of Commerce. Photo courtesy of Rebecca-Lee Longoria. I notice that in both photos people are not respecting the handicap parking needs. The bottom photo has a government vehicle blocking at least 2 and maybe 3 handicap parking spots. In the upper photo the table is set up directly in front of the handicap ramp, with not enough room for a wheelchair to turn or pass. Just a person has a valid point, but might be a little over the top considering the low occupancy of the parking lot at the time the pictures were taken.